What is Tagrix (Osimertinib Mesylate) used for? 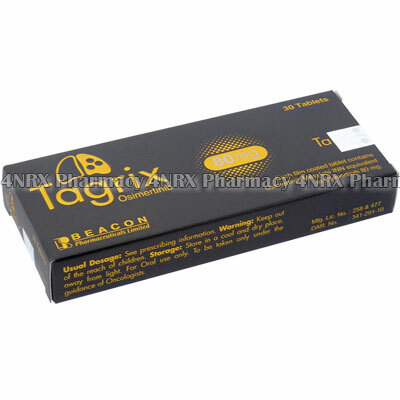 Tagrix (Osimertinib) is prescribed to treat metastatic non-small cell lung cancer in patients with T790M mutation in the epidermal growth factor receptor (EGFR) gene, who developed progressive disease during and after EGFR tyrosine kinase inhibitor therapy. The medication can be prescribed only after the mutation has been confirmed by the laboratory tests. How should I use Tagrix (Osimertinib Mesylate)? The usual recommended dose of Tagrix (Osimertinib) is 80 mg taken once a day. The tablets are taken orally with or without food. The treatment must be stopped if the cancer deteriorates or intolerable adverse events occur. For patients experiencing difficulties swallowing the medication can be dissolved in 50 ml of still water and administered through a nasogastric tube. If you miss a dose, the treatment should continued according to the prescribed schedule. Do not take the missed dose. What are the side effects of Tagrix (Osimertinib Mesylate)? Depending on the severity of your symptoms, your physician will adjust the dose or stop the treatment. To identify any complications in a timely manner, the patients are also advised to have ultrasonic cardiography and MUGA (multigated acquisition) scan on a regular basis. Tagrix (Osimertinib) can affect fetus development; therefore patients must not plan pregnancy while on therapy. Female patients are advised to use adequate birth control methods on therapy and six weeks after the medication has been discontinued; male patients - on therapy and four months after the medication has been discontinued. Please make sure to inform your physician about all other medications, including vitamins, supplements, and herbal products, that you`re taking.